In the bottom of the camera, in that dusty part that accumulates old photos of forgotten events, I found a photo of the almost-finished quilt I took to my cousin for Easter in the UK. 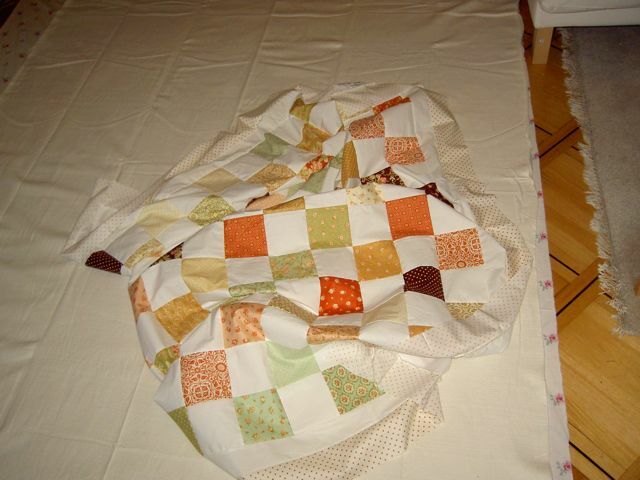 It’s in the process of being basted in that precious corner of the sitting-room floor that is just the right size for a double quilt… once all toys / books / junk / bags of half-read academic books have been brushed aside. As I forgot to photograph this one once I had completed it, this will have to do as a record — until I invade their house by stealth, with a camera, and find it being used as a draft excluder in the garden shed. Does it still count as ‘real’ quilt if I only threw it together in four long evenings, using two charm packs and some cut-up sheet, and then stippled it to pieces, having only added two borders (white and then those marvellous spots)? Pink/white roses on the back, from one of those Swedish store duvet covers, in surprisingly nice cotton. Must go off and finish quilting the (other) pinky one for Miss R: hurray for me, as I have broken out of the I-can-only-be-bothered-to-stipple-everything phase. Results here soon. But don’t hold your breath! But now she has said she doesn’t much like pink anymore. I should have toned done my anti-pink crusade. That’ll teach me.